The great Albert Namatjira’s adoption of the European medium of watercolour for his landscape paintings remains an inspiration to contemporary artists from Ntaria (Hermannsburg) and surrounding regions of Central Australia. 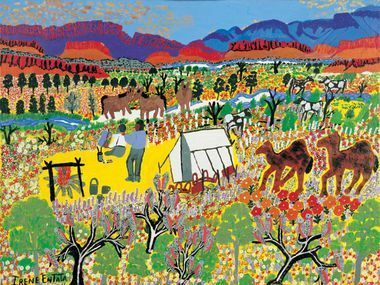 Since the 1930s artists there have been producing vibrant and highly regarded art that has made their country celebrated throughout Australia. This exhibition will highlight work by Indigenous Australian artists from the Hermannsburg School and will include watercolours (from the original and subsequent generations), ceramics and acrylic paintings on canvas.